Bowel polyps are growths on the lining of your bowel. Most people with polyps don't have any symptoms, and only know they have them after an investigation such as a colonoscopy. Some polyps, called adenomatous polyps or adenomas, carry an increased risk of bowel cancer. 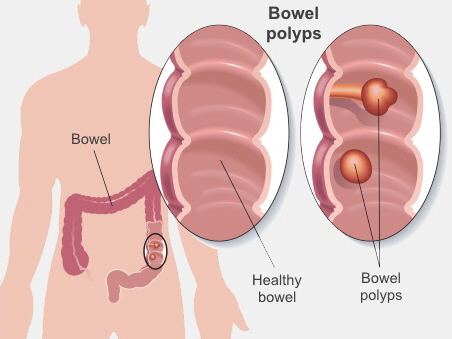 As well as reading the page linked to below, you can find out more about bowel polyps on the Bowel cancer screening page. This page explains what causes bowel polyps, how you find out if you have them, and how they are treated.